At the Genoa Boat Show we met this young skipper on the bridge of the "Enneffe", a modern interpretation of the classic motoryachts of yesteryear created by the Mondo Marine-Navirex boatyard of Savona. Sailing and command experience: my father had always skippered pleasure boats in Europe and elsewhere, and when the time came to tie up and stay with the family for a while he bought a fishing boat in Sanremo. I grew up aboard and got enthusiastic about everything to do with the sea, fishing and sailing. Then I started going to other places and did my first seasons on yachts until, at the age of 19, I met the owner of this one. Current vessel/Flag: the boat I'm now skippering is "Enneffe" which flies the Italian flag. 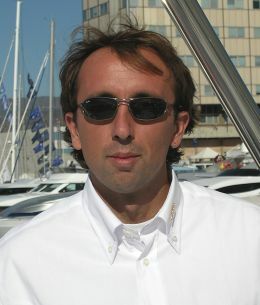 It was built by the Mondo Marine-Navirex boatyard of Savona to engineer Grasso's design, following the owner's specifications and the skipper's suggestions. 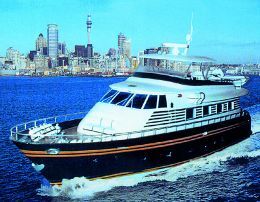 Custom built then, equipped for demanding cruises, 24 metres long with semi-displacement hull and very sea-kindly. The considerable reserve of power (2x1350 HP) means a maximum speed of 23 knots when required. Favourite Marina: Porto Sole in Sanremo of course! Favourite Route: those between Liguria and Corsica, with unpredictable weather and fascinating encounters with cetaceans. What do you feel are the most interesting technological innovations in the yachting world and why? : the evolution of hulls and materials means that boats are faster and safer, and electronic equipment simplifies navigation enormously. Then the devices for increasing comfort on board such as internal gyroscopic stabilisers. We find them rather interesting for a boat like ours. But compass, chronometer and sextant are always there on the chart table! The worst adventure ever: many years ago, crossing from Sanremo to Calvi, we were in mid-channel with a force 7 north- wester, a breakdown and a metre of water in the engine room. During the five hours we were hove-to I somehow resolved the various problems and we managed to return to base. The best memory: there isn't an outstanding one: with the right harmony between vessel and owner, every cruise is great in its own way if you love the sea and the sense of freedom it gives. What do you think of your role as Skipper and the yachting world you work in? : over and above marvellous sensations there's certainly also a less romantic and more pragmatic side to a skipper's life, meaning all the organisation on board, though it's less complex with a sole owner than with a charter company; and then handling bureaucratic matters is always difficult, especially abroad. Apart from this one, what other vessel would you like to command? I'm pretty satisfied with this boat, but one day... maybe something bigger... ocean-going perhaps. Relationship with owner and crew: eleven years with the same owner and four boats speaks for itself about the kind of relationship; and I also get on very well with the crew.